http://newiprogressive.com/images/stories/S5/wi-172-e-app-i-041-s5.jpg Even Governor Walker says adding new lanes between Appleton and De Pere doubtful. MADISON - Recent comments by Secretary of Transportation David Ross cast doubts on an a call by Governor Walker to expand I-41 from 4-6 lanes between Appleton and De Pere said State Senator Dave Hansen (D-Green Bay). 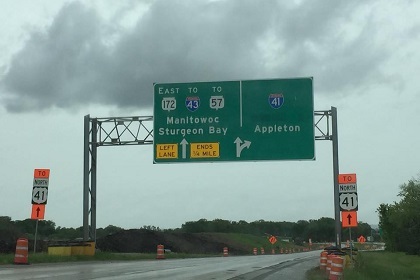 “Barely three weeks after Governor Walker ordered the DOT to evaluate the expansion of I-41 his own DOT secretary appears to have shut the door on any expansion when he said that a way to increase funding to repair local roads would be to take on fewer mega-projects,” said Hansen. Speaking to members of the La Crosse Chamber of Commerce, Secretary Ross said new funds weren’t needed to fix local roads because funding could be shifted away from bigger “mega-projects” to local road projects. The DOT secretary’s comments come just a little more than a week after Walker himself questioned the need for adding more lanes when rebuilding state highways. According to reporting by the La Crosse Tribune state General Transportation Aid payments to local governments covered about 30 percent of local road work, but has fallen to about 18 percent now.